The ‘Eat in Sustainia’ publication gathers the challenges, opportunities and solutions of the global food system in relation to the future of food, health and our environment. We completed this project in partnership with the EAT foundation in 2015. The Sustainable Development Goals reflect the internationally-recognised human rights to affordable and adequate food, to health, and to a healthy environment. They also recognise that food can be an entry point to many other societal challenges. Sustainable and healthy food solutions already exist on the micro level. However, a bottom-up change is not enough, we need policymakers, food industry leaders, and consumers to innovate together towards a more sustainable food system. Although the Eat in Sustainia publication builds on existing evidence gathered from expert sources such as the WHO and FAO, it is not meant to be a scientific review. It is a conversation starter to get different stakeholders talking and innovating around the topics of food, health, and sustainability. The publication was launched at the EAT forum in Stockholm to start this conversation. 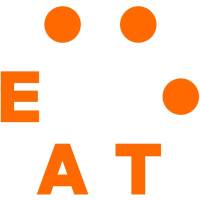 EAT is a global, non-profit startup dedicated to transforming our global food system through sound science, impatient disruption, and novel partnerships.